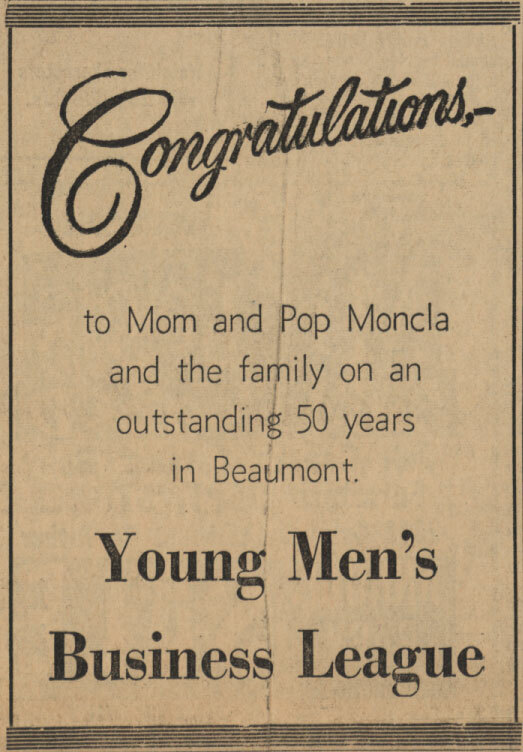 THE SUNDAY ENTERPRISE | Fifty golden years of food service to Beaumont and vicinity will be climaxed Monday by the Moncla family as Gaston and Mayrose, and their sons, A. G. and Leon and their wives, are hosts at an anniversary open house from 5 to 8 p.m. Scene of the open house will be the Gold Room, at Mariposa and McFaddin, the newest of the four departments of the Moncla restaurant and catering business, oldest of its kind in Beaumont. 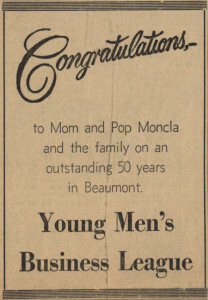 A lot of Beaumont history is intertwined in the lives of the Monclas who have been fine hosts to the great, the near-great and countless others, and they invite all their friends, new and old, to share this great moment with them. Gaston, born in Chataignier, Louisiana, was a news butcher on Southern Pacific passenger trains between New Orleans and Houston when he decided to stop off in Beaumont to visit a friend name Ford who was in the restaurant business. Gaston stayed in Beaumont, working first as an apprentice mechanic in the Seagraves Garage. Then, a Congress Candidate, Judge George O’Brien, hired Gaston to drive him – in a model T Ford – on his campaign around the district. This lasted six months. Luckily for Gaston and Beaumont’s lovers of good food, Gaston didn’t wind up in Washington. O’Brien wasn’t elected. Then Gaston joined the staff of the Kiber Cafe on Crockett Street, staying ther six months. He switched to the Opera Cafe, operated by Armand (Peg) Chargois, in the old Kyle Building. Two years later, Gaston opened Beaumont’s fist deli catessen, in the building of the old Andrus Park grocery store at Orleans and Liberty. 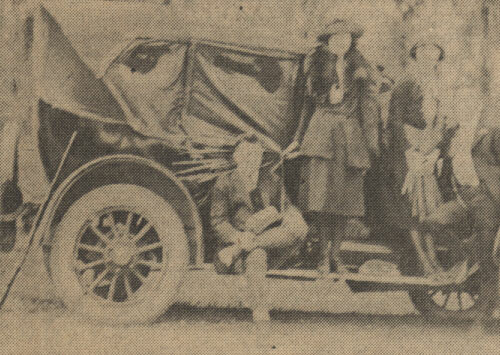 This 1920 Buick belonged to Armand (Peg) Chargois, sitting on fender, beside Mrs. Chargois. Other couple are Gaston and Mayrose Moncla. Chargois owned the Opera Cafe, in the old Kyle Building. Moncla worked for him before launching his own career as a restauranteur — a career which withstood the Depression of the 1930s. 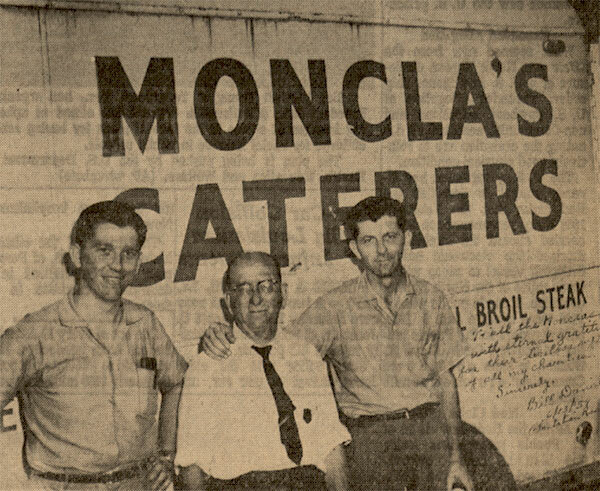 Today, Moncla’s food business is the oldest of its kind in Beaumont. In the intervening years of the scenes and picture changed a number of times . . . including Moncla delicatessens in Port Arthur and Houston, and on College Street at Park . . . a wholesale seafood and poultry business at Forsythe and Neches . . . three liquor stores (during World War II) . . . a 30-cow (Jersey) and 100-hog pig farm for 15 years on the 31-acre tract which now has been taken up largely by the Sherwood Forest subdivision. In their seafood business, for example, they sod a thousand gallons of oysters a week, trucking them in from Houma, Louisiana. In 1951, the Monclas opened their banquet room, Mont-Leon. Here Mrs. Ben Shipley, who won the naming contest, is being presented with the prize, a check for $25, by Gaston Moncla. They supplied seafood and poultry to chain stores from Orange to Houston, including the A&P which then was at McFaddin and Mariposa, Beaumont’s first shopping center. It was 31 years ago – Aug. 27, 1937 – that Gaston and Mayrose opened a new delicatessen at 535 Mariposa, site now of their popular cafeteria. As time went by and their popularity grew the Monclas added Mont-Leon, in 1951 their big 250-person banquet room, the Cypress Room, for intimate luncheons, meetings of up to 35 persons and parties (1964) and the Gold Room, 85 persons, for receptions, special dinner parties and the lie (1967). Sons A. G. and Leon actually grew up in the business but A. G. formally joined in 1946 when he returned from Korea where he had been an Army sergeant, an Leon in 1954 upon his graduation from high school. 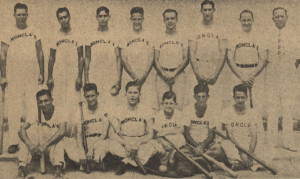 This baseball team was sponsored by the Monclas in 1942. 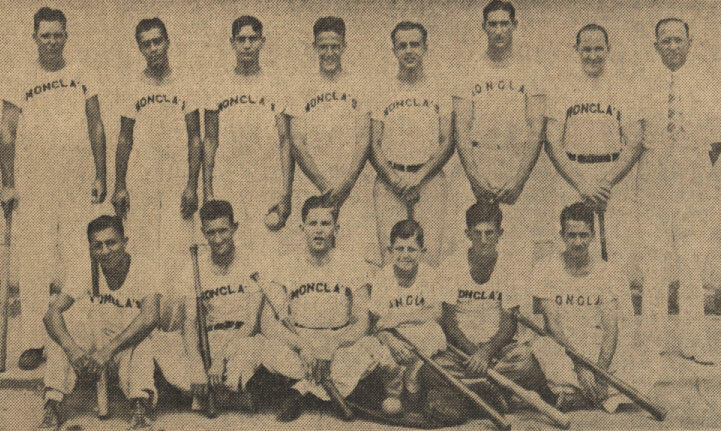 Mascot A.G. Moncla, at age 12, is in the front row. A. G. is married to Aline Legendre of Beaumont and Leon’s wife is the former Bernadette Fazio of Beaumont. The three families have their “compound” on Junker Road, (320, 350 and 390) on eight acres of reserved when the farm was sold for development of Sherwood Forest. Gaston and Mayrose have six grandchildren, all boys. A. G. and Aline have four sons, Wayne, 18, a Lamar Tech freshman (mechanical engineering); Kenneth, 16, junior, Forest Park High SChool; Gary, 14, Forest Park freshman, and Randy, 12, Memorial Junior High. Leon and Bernadette have Leon Jr., 4, and Dennis, 7 months. 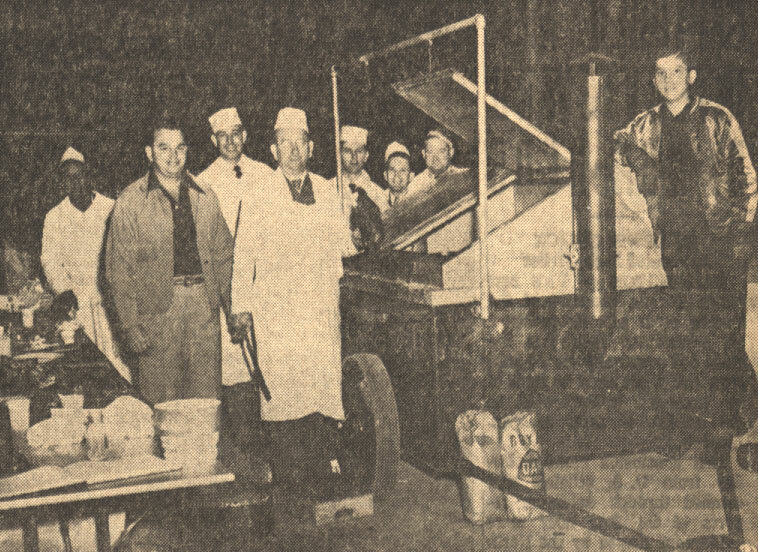 This photo of the famous Moncla barbecue wagon was made in 1948, with Gaston Moncla in center, son A.G. behind his left shoulder, and son Leon at far right. In the family corporation Gason is president; A.G., vice president, Leon, General Manager, and Mayrose, secretary-treasurer. A. G. is general chairman this year of the South Teas State Fair and is serving his fifth consecutive year on the board of the Young Men’s Business League, sponsors and organizers of the fair. Leon is in his fifth year board of directors of the Texas Restaurant Association, of which the Moncla firm is a charter member. He is also a member of the Business and Professional Men’s Club. Both sons are members of the Chamber of Commerce and both have been president of the Sabine Area Restaurant Association. A. G. is Red Cross food chairman, member of the Beaumont Country Club and has been active in Boy Scout work at St. Anne’s Catholic Church. All the Monclas are parishioners of St. Anne’s Catholic Church. At 72 and looking much younger, Gaston Moncla attends 6 a.m. Mass and communion every day before opening cafeteria, a tradition he has faithfully maintained over the years. 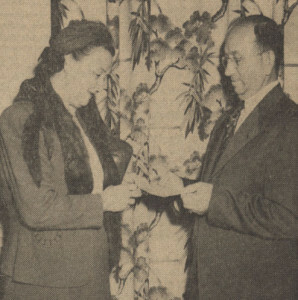 Mayrose Chargois and Gaston Moncla were married in 1922. This photo was taken a year later. Gaston and Mayrose (Chargois) are just four years away from their golden wedding anniversary. They were married in Beaumont on Christmas Eve, 1922. Before building what is now the Moncla Cafeteria, Gaston and Mayrose operated a delicatessan on the northwest corner of Calder and Mariposa, opening in 1930. It was a “little hole in the wall,” Mayrose recalls. “Gaston had himself and a staff of three fulltime.” Now Moncla’s has a staff of 13. Oldest in point of service is Vera Hargrave, head waitress, who has been with the Monclas for 17 years. The original delicatessen at Calder and Mariposa was in the old ABC Building, also occupied by a Bill Thames Drug Store (later across the street on the southeast corner) and a chain grocery. This site was occupied for seven years, until the present cafeteria was opened as a delicatessen which became famous as a place for family Sunday dinners. Over the past 18 years the Monclas have ranged far and wide – 100 mile radius – with their catering service, providing sufficient, delicious food for as many as 6,000 persons. It doesn’t matter what the occasion – weddings, picnics, political conventions, company demonstrations, beach parties, fish fries, church gatherings. Every year the Monclas cater Bill Daniel’s party for 5,000 crippled children at the Bill Daniel Ranch, Romayor, Texas. They make no charge for this, furnishing everything except the meat, which Daniel supplies. This photo was made in 1959 and autographed by Daniel, who wrote: “To all the Monclas with eternal gratitude for their tireless support of all my charities. Sincerely, Bill Daniel. 6/13/’59, Plantation Ranch.” – Gaston is flanked by sons Leon, left, and A.G. When Bill Daniel was governor of Guam, he appointed Gaston and Mayrose into membership of the Ancient Order of Chammori, which dates back to 1521, according to the scroll presented by Daniel. This makes them honorary citizens of Guam, chamorras being the term for natives of the island, an American possession. Gov. Price Daniel, Gov. Allan Shivers, and Gov. W. Lee (Pappy) O’Daniel used Moncla catering service on several occasions when they were in office. The Monclas have catered many large civic affairs over the years, many of them so regularly it is practically a tradition with them. A man on whom his 72 years ride easily, Gaston Moncla loves to fish. The family owns a beach house and an 18-foot twin-outboard boat. Mayrose often accompanies him on his fishing expeditions. Prominent Beaumonters have also enjoyed Gaston’s fishing hospitality. As longtime Beaumont hosts, the Monclas have plenty of precedent for their skills in serving the public with fine foods. The family is only two generations out of France, where the preparation and serving of food is a fine art. They begin their second 50 years with bright hopes and plans for the future, including – next – remodeling of Mont-Leon.